Hello! I’m Mich, the new junior reporter for Second Life Games blog. I will test and review some of the games I find in SL, just so you’ll get to know how much fun there is to find out there. Today I will tell you about “En Garde!”, a new turnbased strategic fencing game for two players. Check it out! Here I am about to pierce my friend Kat Burger… or is it the other way around? En Garde is a new game from Procyon Games and creators Rifkin Habsburg and Reiner Knizia. Previous creations from Procyon Games that you might already know of are group games such as Frootcake, Danger Zone and Zingo (not Zyngo). Those games are best played by smaller groups of players. En Garde however, is a fencing dueling game for two players only, who challenge each other on the narrow white stripe that is the dueling mat. It’s actually a turnbased cardgame, and you need to equip a HUD that will show the cards before you can begin play. There is also an Epee (a fencing sword) that you can use during the fight, and both items (and the rules of the game) can be found by clicking the scoreboard sign above the fencing mat. When the game starts, each player stands on opposite ends of the mat 22 paces apart. The players then take turns of playing cards from their hand, each numbered 1 through 5, that will allow them to advance or retreat and, if in range, attack the opponent. The object of the game is to get a successful attack on the opponent – to score a touch – and the first player to reach five such scores is the winner. Cards are drawn from a deck of 25 cards consisting of five cards each of the numbers 1-5. Each player draws five cards to hand at the start and played cards are replaced by new cards from the deck until the deck runs out and the round ends. So, at the start, if you play a 5 and choose to advance, you will move five steps closer to your opponent, who in turn probably also will advance a little, and soon you will square off somewhere near the middle of the dueling mat. If you are five steps away from your opponent, playing a 5 card will attack him. However, if he also has a 5 card in hand, he will automatically parry the attack and will probably launch an attack during his turn, using his remaining cards. This is all easy enough, but it gets more complex. Cards can be combined in various ways to make stronger attacks or make attacks possible from a larger distance. Two or even three cards of the same value will attack with double or triple strength. A double strength attack can only be parried with another two cards of the same value. A triple strength attack can never be parried (considering there are only five of each card in the deck). You can also combine movement with an attack, for example use a 5 card to advance and then use one or more 4 cards to attack (lunge), thus reaching your opponent from nine paces away. Any such combined attack, properly named advance-lunge, can be either parried normally, or simply dodged by retreating any number of steps. A retreat uses your turn and allows your opponent to attack again. If no touch is scored before the small deck of 25 cards has emptied, the winner is decided based on relative position on the mat. Thus it pays to be aggressive and advance more than retreat during the game. When the deck runs out of cards, the game also checks the decks of both players automatically and plays any viable cards to attack as a last minute action. This, along with the automatic parry of a normal attack, can become a little confusing for the beginner. Although the HUD reports the number of cards remaining in the deck, it’s easy to loose track of that during the game. Often it comes as a surprise that, for example, a smaller retreat caused the deck the empty, auto-attacks to quickly be performed, the winner decided and suddenly players find themselves back at their starting position ready for a new round. Slower auto-actions would make the game pace a little smoother and players wouldn’t have to check back in chat history to figure out exactly what happened and who won. 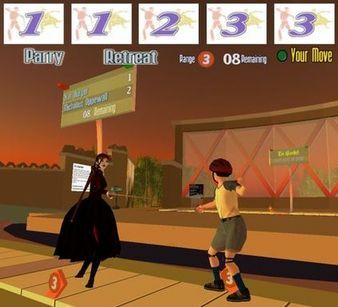 Sudden surprises aside, En Garde is a fun and thrilling game. The HUD is easy to understand for the beginner and the gameplay is complex enough to keep experienced players interested a long time. It’s a game well worth trying and can be found at Procyon Games in Malrif. – Just like in real life fencing, initiative plays a major role. Combined attacks that are easily dodged can seem weak at first, but it allows you to advance on the mat and claim position. Even a double strength combined attack (advance + double strength lunge) is not wasted, since you will probably be on the attack again in your next round because your opponent was forced to retreat. You have favorable position, and have also drained the deck so the round ends earlier, all in your favor. Just make sure you have some defense after a combined attack, in case your opponent can parry and retaliate. – It is possible to count cards from a 25 card deck. If you play the game in this serious fashion, try to keep track of what has been played (check chat history) so that you can guess what cards your opponent has in hand and what the remaining cards in the deck can offer. – Don’t forget the auto-attacks at the end of rounds. Try to keep track of the remaining cards number in your HUD to anticipate the end, and make sure you are in range of your opponent for your remaining cards in hand to be played automatically. – Do not panic if you disconnect or click yourself out of the fencing action. You have three minutes to return to the game, before your opponent is declared winner by default. – Considering the small deck and any combined attacks, players can only expect to get five or six turns each during any round. Plan your gameplay accordingly. And have fun!